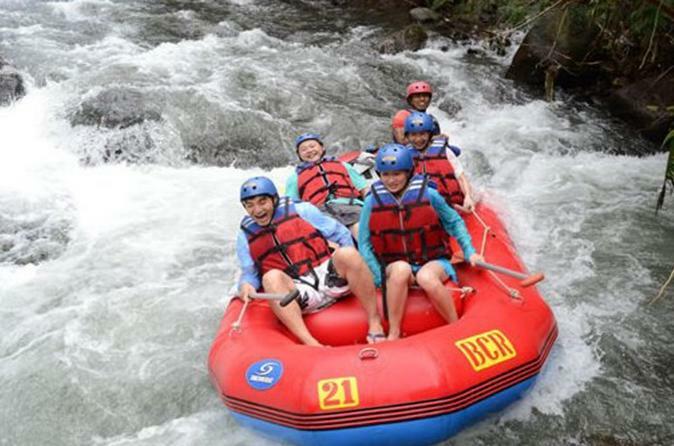 Bali White Water River Rafting is Rafting in Bali, 1st safety priority rafting company. Experience your adventurous rafting journey on Ayung River. Ayung River, the biggest and longest river in Bali.Have the highest enjoyment of rafting and experience the unrivalled way to appreciate the natural scenery, wildlife and exotic plants of Bali. You will be picked up in the morning and taken to the scenic Ayung River for an unforgettable white water rafting experience. You will explore the beautiful river and exciting rapids. Soak up the the beautiful panorama along the river. At the end of adventure, you will enjoy a delicious Indonesian buffet lunch. White Water Rafting at Ayung River is an exciting water adventure that explores 8km of river and spectacular natural environments. During the tour, you will be accompanied by experienced instructors that guarantee your safety. This is a must do while you are in Bali, promising adventurous and unforgettable rafting experience, It's easy enough for first timers and children, but challenging enough for people looking for an exhilarating ride. During the tour, you will be accompanied by experienced instructors that guarantee your safety. One that you will really appreciate as most of you will be probably exhausted after the long rafting.